After the brutal murders of killer Johann Van Damme (Terry Mullett) Uncle Mel Boogjumper (Darren Andrichuk) nearly had to close Camp Crystal Meph forever. With the enthusiasm of his nephew Todd Boogjumper (Dave Peniuk) behind it Camp Crystal Meph is reopening as a rehabilitation center for mentally ill adults. The deaths of campers and staff begins to raise the question, has the cursed killer Johann Van Damme risen from the grave or is this the work of a criminally insane camper copycat killer? 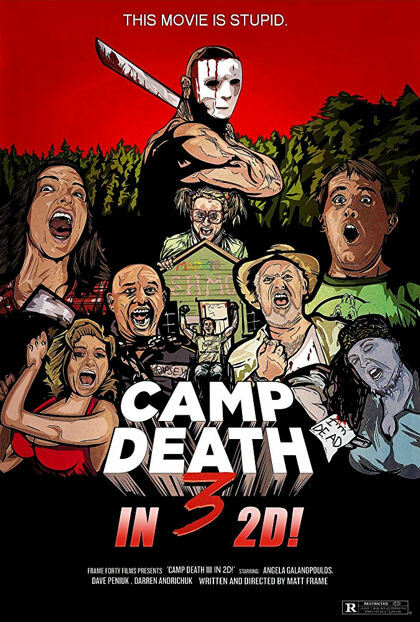 Camp Death III is proudly presented for your viewing pleasure in 2D! It’s a completely insane mocking of horror movies, specifically Friday the 13th 3D. If you're worried about missing parts 1 and 2, don't! They never existed. With a slew of writers the Matt Frame directed Camp Death is all over the place in its zany goofiness. Actors are given leeway to extend scenes of comedy to their extreme. Not since Ernest have I seen this level of ridiculousness at camp. It’s a Scary Movie style spoof without the intelligence. It doesn’t hold back and it will offend. I enjoy the very racist “Irish” performance and his love for the potato. Angela Galanopoulos shows she has the lungs to be a legitimate scream queen. Verta’s (Katherine Alpen) Charleston Chew poo covered performance was fun for all the wrong reasons. Officer Bert Gaybert (Kyle Fines) pulling a wheelchair containing a dead body was almost funny but I mostly enjoyed seeing the real use of fire, something that is lacking in film. Crapsey (Shawn Bordoff) made me want to kill myself, luckily he was weed whacked early on. Otherwise, this movie is as mentally challenging as the campers who attend Camp Crystal Meph. Parodies are not my preferred form of film and this is a parody in its extreme. I firmly believe in comedy nothing is off limits and everything can be funny, this just isn’t. With zero performances that aren’t completely over-the-top, zero realistic characters and a sense of humor made for a juvenile, this movie will offend anyone who's ever known anybody with special needs and probably all horror fans.